You've met India's hornbills in the caricatured compilation, Hornbills of India. 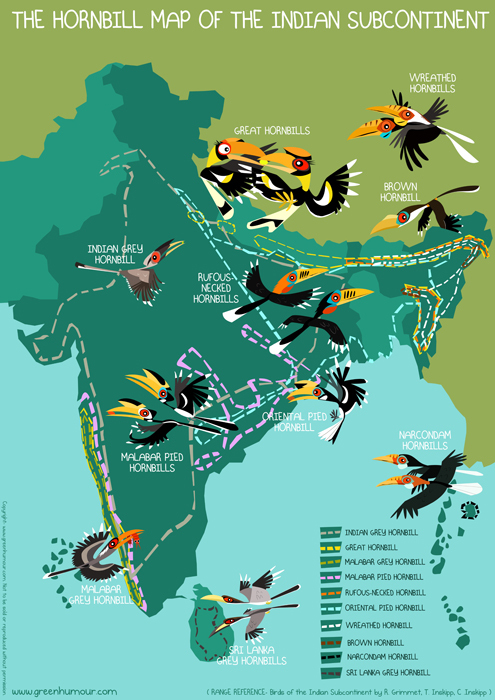 Here's an illustrated map that shows you where to find these spectacular birds in the sub-continent. Of the 10 species, the Indian Grey Hornbill is the most widespread, followed by the Great Hornbill which is found both in the Western Ghats as well as the North-East. The Narcondam and the Sri Lanka Grey Hornbills are confined to the islands of Narcondam and Sri Lanka respectively. The Malabar Grey Hornbill is endemic to the Western Ghats. E-mail me on rohanchakcartoonist@gmail.com to place your orders (mentioning the number of prints, postal address and contact number for delivery). Readers outside of India can purchase the prints directly from my webstore here. Happy hornbill-gazing!